Luton boxer Sam King, 14, won gold to become Sweden’s King of the Ring in the 63-66kg Junior Category over the weekend. 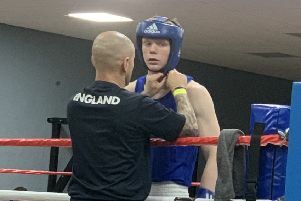 The youngster drew Denmark’s Sigurd Glemmestad from Raus BK Boxing Club in Saturday’s semi-final which proved to be the tougher of his two bouts. This fight showed outstanding fitness levels from both boxers and, following a hard-fought first round, it was the second round where King made his breakthrough. A flurry of combinations to his opponent’s head and body from the Luton representative forced his Danish opponent to take a standing eight count midway through the round. In the third round, Glemmestad rallied but this did not prevent King from winning the contest three rounds to nil. King then took the ring for the final the following day and delivered gold by winning against Edvard Kelkka from Tampere BK Boxing Club in Finland. The teenager was explosive in the first two rounds, and again, King’s opponent required a standing eight count in the second round. However, it was towards the end of this round a stray blow to King’s elbow meant he lost the use of his left arm for the remainder of the match. With two rounds already in the bag, King showed a different side to his boxing in round three. He chose to fight on the back foot making himself hard to hit and in doing so recorded another unanimous decision, ensuring the gold medal was his.